She's sure to get extra height in her jump with the lightweight SKECHERS® KIDS Skech-Air 80169L sneakers. Sneakers in a knit mesh upper. Rainbow pattern features metallic fabric underlay. Padded collar and tongue for comfort. Adjustable lace-up closure. Side "S" logo. Soft mesh fabric lining. Features an Air Cooled Memory Foam cushioned footbed for all-day comfort and support. Shock-absorbing midsole. Flexible rubber outsole for traction. Imported. Measurements: Weight: 10 oz Product measurements were taken using size 5.5 Big Kid, width M. Please note that measurements may vary by size. Weight of footwear is based on a single item, not a pair. 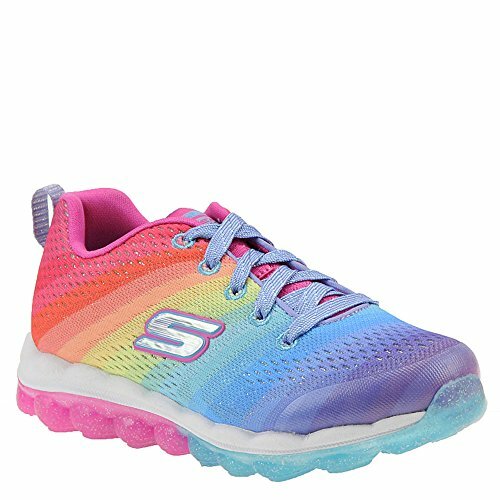 She's sure to get extra height in her jump with the lightweight SKECHERS® KIDS Skech-Air 80169L sneakers. Adjustable lace-up closure. Side "S" logo. Soft mesh fabric lining. Features an Air Cooled Memory Foam cushioned footbed for all-day comfort and support. Shock-absorbing midsole. Flexible rubber outsole for traction. Imported. Measurements: Weight: 10 oz Product measurements were taken using size 5.5 Big Kid, width M. Please note that measurements may vary by size. Weight of footwear is based on a single item, not a pair.